Princeton’s Umbria Brushes feature synthetic fibers with an extra degree of stiffness to move and control color. 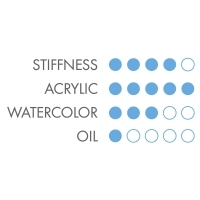 Unlike natural bristles, which become soft and distorted when used in waterbased media, the bristles on these brushes retain their shape and stiffness. Each brush includes two shades of synthetic fiber, seamless gold colored ferrules, and a Velvetouch handle for excellent grip and control. 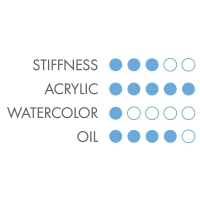 They can be used with heavier acrylic paints as well as oils and waterbased oil colors. Dagger Striper — This unusual "sword" shape is excellent for precise control of fine lines and curves of varying widths.